I don’t own a lightbox… but I DO own a small glass-top table that is in the bay window of our kitchen. It’s usually our main table for meals, but it works wonderfully for marking quilt tops! First, I take a small lamp out of my bedroom and plug it in near the table. Tape pattern to the table. Lay quilt top over the table, and weigh it down with a few stacks of books. Close the blinds, and VOILA! You have an impromptu light box! Trace the pattern carefully with your marker of choice. 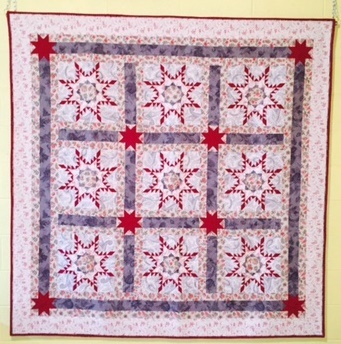 Lay the quilt top on the floor to admire. Ahhhh, yes, this one will be fun to hand quilt! I like the fernlike shapes, spirals, and rhythm. Keep us informed on the process. Lovely! I see this style all the time in machine quilting but never by hand. Can’t wait to see the outcome! Great idea for a lightbox!